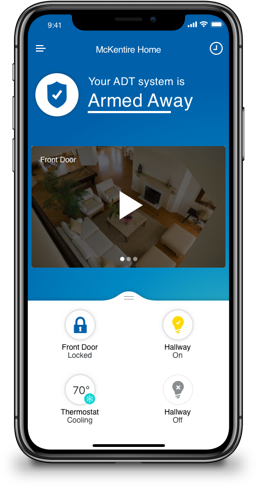 The ADT Control app extends the capabilities of the ADT Command platform, giving you remote access and control of your smart security and automation system from virtually anywhere using your Android or Apple iOS smartphone. Arm or disarm your security system from virtually anywhere. View live video to check in on your home, or when you receive an alert from one of your sensors. Lock or unlock your doors remotely to let in contractors or the dog walker. Receive alerts when your system status changes or a door is unlocked. Control your lights remotely so your home always looks occupied. Adjust your smart thermostat to make everyone comfortable and potentially lower your energy expenses. With the Control app you can create one-touch Scenes, customizable combinations of actions that adjust your system at different times of day. For instance, you can set up a Scene that adjusts your thermostat and turns on lights so your home is even more welcoming when you arrive. And with geo-fencing technology, you can receive a reminder if you forget to arm your system once you leave home. We all love video doorbells, cameras, smart locks and smart home devices that can be controlled with the sound of our voice or from the palm of our hands. To help keep you and your family safe, combine all of this with professional monitoring from the #1 smart home security provider, ADT. ADT & the Scott Brothers have teamed up to show you how Real Protection can not only make your life easier, but more importantly help keep you more secure. Check out the products and services ADT has to offer and be on the lookout for more from ADT, Jonathan and Drew!